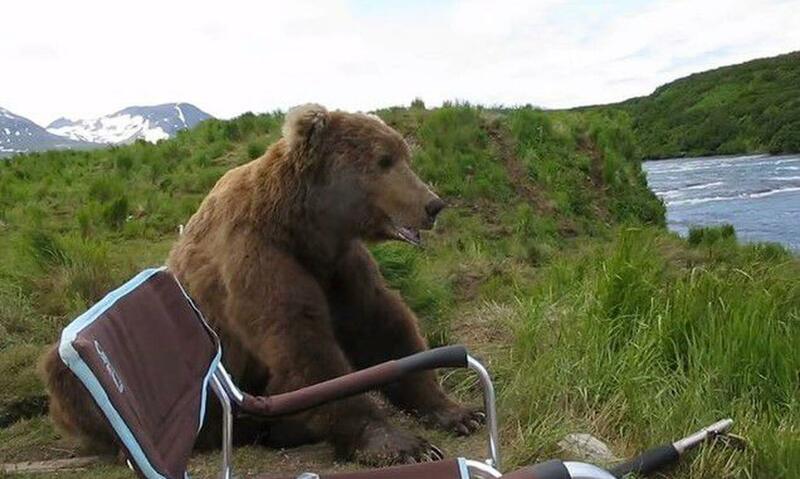 A stunning video filmed by an Alaskan wildlife enthusiast has captured an incredible close encounter with a brown bear. The bear lumbers over the the brave camper’s site, having a brief sit to survey the riverbed before turning back the way it came. The video was posted by Drew Hamilton, who’s Facebook lists him as a tech worker at the Alaska Department of Fish and Game. The video was shot at the McNeil River State Game Sanctuary, in Alaska. According to CNN, the world’s largest concentration of wild brown bears gathers at the sanctuary ever year from June to August, gorging themselves on salmon. The video has shared more than 22,000 times on Facebook. ‘Was wonderful to watch but you are NUTS and eh-eh when he moved close amazing – I cannot imagine!’ wrote user Peg Watkins McElmuray. ‘Ha ha… He probably just wanted to sit down and have a beer with you. Couldn’t you see he was breathing hard? Come on Drew help a guy out!’ joked user Brian Young. According to the McNeil Web site, no one there has ever been killed by a bear. Still, the site notes, it’s important for camper’s to remember that they’re in the bear’s home and not the other way around.